Presented by the Friends of the Woburn Public Library, Perkins’ appearance is free and open to the public. A book sale and book signing will take place after the presentation, with books provided by Book Ends of Winchester at a discount to attendees. Wow, no pressure. I'd better be good. 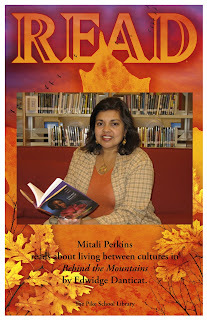 The poster above is provided by the Pike School librarians, who have a wall of fake READ posters featuring visiting children's book authors reading favorite books -- which I thought was such a great idea I asked for permission to share it on my blog. I picked Edwidge Danticat's Behind the Mountains, by the way, a YA novel I loved.